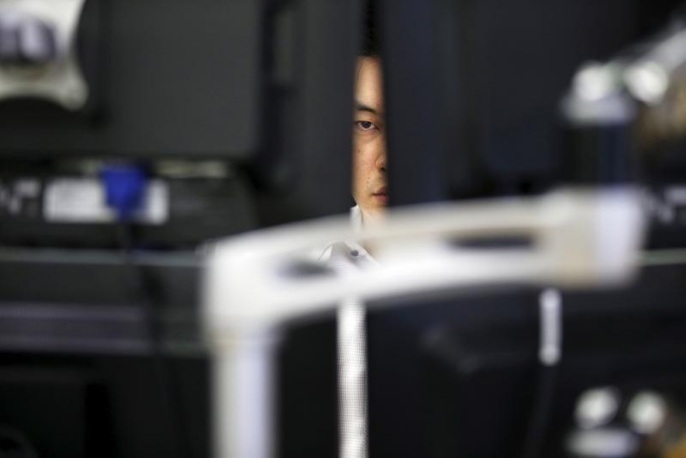 FILE PHOTO: A currency dealer works at a dealing room of a bank in Seoul, South Korea, August 25, 2015. SEOUL - The central banks of China and South Korea appear to be on track to extend a $56 billion currency swap deal that expires on Tuesday, a senior South Korean source said, describing its prospects as “optimistic”. South Korean and Chinese officials have been in talks to extend the currency swap deal at a time when Beijing is unofficially restricting trade and tourism with South Korea in retaliation against Seoul’s decision to deploy a U.S. anti-missile defense system. The $56 billion swap ensures both central banks have access to large amounts of each other’s currency should extra liquidity be needed at short notice. Bank of Korea Governor Lee Ju-yeol remained cautious on Tuesday, and asked for patience as talks were still ongoing. “There is no outcome yet, and we have meetings even today,” Lee told reporters on Tuesday, when asked if the deal would be extended. “As we talk, expiration isn’t all that important and negotiations are still taking place. It will be great if things can be concluded before expiration but that is not always the case,” Lee told reporters. South Korea’s finance minister has publicly said the deal should be extended to cement existing financial safety nets, but the ministry declined to comment on Tuesday. South Korea’s decision to host the Terminal High Altitude Area Defense (THAAD) has drawn fierce criticism from China, which says the system’s powerful radar can probe deep into its territory. China agreeing to extend the currency swap deal would indicate an uneven response to the THAAD, and signal an easing of tensions between the two nations in economic terms, said Kim Doo-un, a foreign exchange analyst at Hana Financial Investment. “Extending the deal could indicate that Beijing would still want to separate economics from politics,” Kim said. China’s Communist Party is scheduled to hold its policy-setting five-yearly congress from October 18. The People’s Bank of China was not immediately available for comment on the currency swap negotiations. The $56 billion agreement with China is South Korea’s biggest currency swap deal, accounting for about 45 percent of its swap arrangements. The central banks of China and South Korea appear to be on track to extend a $56 billion currency swap deal that expires on Tuesday, a senior South Korean source said, describing its prospects as “optimistic”.